The journey of a sea turtle is incredible. Adult sea turtles travel thousands of miles to go back and forth between feeding and nesting areas! The mother is able to find her way back to the same beach that she was born on in order to dig her nest and lay around 100 eggs. The base structure is made out of green foam blocks that we cut in the shape of the nest to fit inside of the tank. We spray painted it with sand-colored paint, and once dry, we placed it in the tank as close to the flat front as possible. We poured playground sand (from the hardware store) around the foam on the sides. When sand started coming through the front, we used plain old Elmer’s glue, our fingers, and sand to seal the front edge of the foam next to the glass. It gave it kind of a wet sand appearance, while keeping the sand from filling the nest! Meanwhile, we spray painted about 100 ping pong balls a glossy white. Once dry, we placed them in the nest. To top it off, we cut one of them open to look jagged, and then placed a toy baby sea turtle inside it to look like it was hatching. With the adult sea turtle replica on the top of the tank lid, it makes for a very visual scene that students immediately grasp. 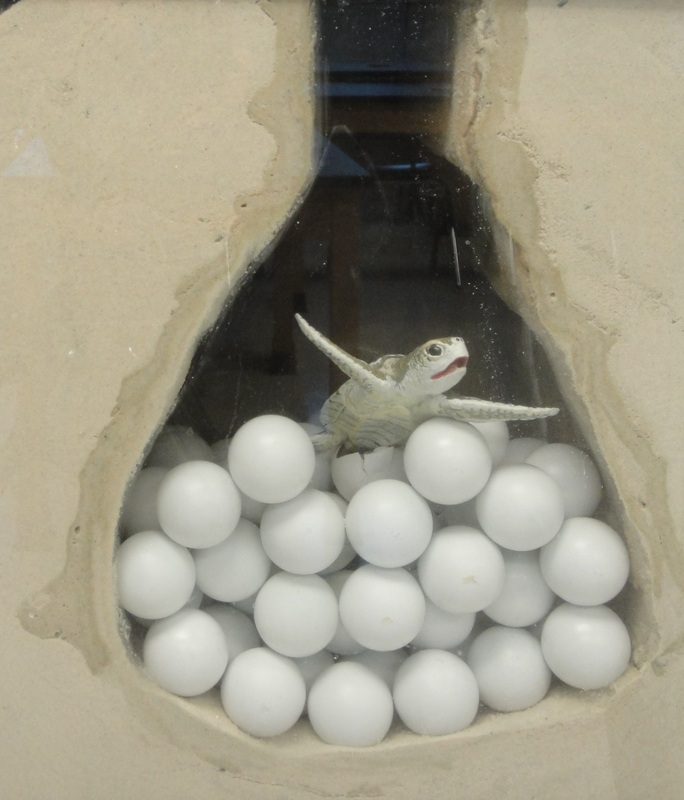 When they hatch, the tiny hatchlings have a hard road ahead and encounter many obstacles. They spend TWO days breaking free from their egg and climbing up the nest that their mother dug. Usually at night, they come out of the nest and find the water by following the angle of the beach and the moonlight that reflects on the water. They scurry down to the sea and then swim for days out to the open ocean where they will be safer from predators. And so begins a life of journeying the sea! TIP for teachers and Marine Bio lovers: check out this module which lets you virtually experiment with how sea turtles orient themselves when they emerge from the nest: http://www.chance.psu.edu/modules/Sea-Turtle-Hatchlings/sea-turtle-hatchlings.html. We also use Kate Mansfield’s “Sea Turtle Survivor” simulation lesson with ping pong balls for students to really understand the natural challenges alone that make survival difficult for sea turtles: http://web.vims.edu/bridge/survivor.pdf. Want more on sea turtles? Here’s our post all about sea turtle nesting season!